Brett Jenkins has been named as a finalist in the Physical Activity Champion catergory of the UK Active Awards, for his outstanding work in changing the lives of older people. Brett, who works as a Senior Wellness Manager across two of Anchor’s flagship Retirement Villages; Hampshire Lakes in Yateley and Bishopstoke Park in Eastleigh, was nominated by his General Manager Rhona Smith. The UK Active Awards recognise and celebrate excellence and innovation across health, wellbeing and fitness in the UK. The winners are decided by the general public and voting is now open. Brett has worked in the health and fitness industry for over 25 years. Starting off his career as fitness instructor in his native South Africa, he soon worked his way up to General Manager in both the private and public sectors. In 2016 his fitness passion took a different turn when he started training older adults and transforming them into Active Aging Adults. He has built up the Wellness Centre within Anchor Trust’s Hampshire Lakes Retirement Village in Yateley and has made a key connection between the inner village and outside communities. 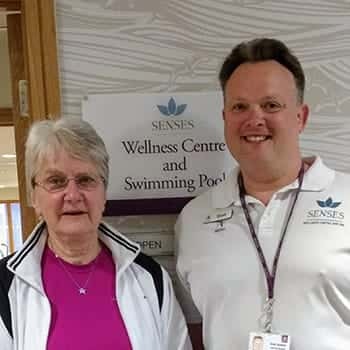 Jo Taylor who has lived at Hampshire Lakes for over two years said: “Since moving to Hampshire Lakes I have been inspired to take regular exercise in our Wellness centre. The voting is now open and will be voted for by the general public. The results will be announced at the UK Active Awards on 21st June. For more information on Hampshire Lakes, contact 0808 102 4070.